Имате въпрос към The S.K.Y Resort? Идеален за развлечения и отдих, The S.K.Y Resort се намира в Хад Яо, който е един от районите на Краби. Хотелът не е далеч от центъра на града - намира се само на 43.8 km от него, а до летището се стига за около 25 минути. С удобното си местоположение хотелът предлага лесен достъп до всички градски забележителности, които задължително трябва да се видят. The S.K.Y Resort прави всичко възможно гостите да се почувстват удобно. Затова хотелът предоставя най-добрите услуги и удобства. Гостите на хотела могат да ползват съоръжения като 24-часова рецепция, експресно настаняване/напускане, Wi-Fi връзка в общите части, паркиране на автомобили, паркинг. Хотелът се характеризира с 5 стилно обзаведени стаи за гости, в някои от които ще намерите хавлии, климатик, бюро, душ, вана. Хотелът разполага с голямо разнообразие от развлекателни съоръжения като гореща вана, голф игрище (в радиус от 3 км), гмуркане, риболов, масаж. С превъзходните си удобства и отличното си местоположение The S.K.Y Resort е идеално място, в което можете да се насладите на престоя си в Краби. One night is enough. The Jacuzzi is not working, water is not clean and doesn't work well. Breakfast is not tasty. I won't recommend anybody to go there. Bungalows are nice, big and pretty clean. However: The wifi works only for a few hours every evening. Most of the time there is no staff around but if there is, they're nice and helpful. TV and jakuzzi don't work at all. Consider them only as decorations for photos. This was perhaps the most unacceptable hotel experience I've ever had in nearly 10 years of living in Thailand and staying in probably 100 different hotels. Problems: 1. The hotel is not where it is marked on the map, which would have been beachside. It is nearly 1km inland, making it confusing to find as well as not as described. 2. I arrived and the place looked desolate. The reception area looked like it hadn't been used in months. Thanks to my noisy motorcycle, someone appeared and looked confused. I speak fluent Thai and said I reserved a room (note: I did this the day before so it was not late minute). The staff member apologized and said the room hadn't been cleaned and asked me to wait. It was 2pm. This took 45 minutes. 45 minutes of me waiting in my motorcycle riding gear, uncomfortable and sweating. 3. In the room, which is ok but not up to standard for the price--given the location is not on the beach--there was no soap and no shampoo. The handsoap dispenser was empty. 4. I was not given a wifi password, and there was no wifi network visible. The description promised wifi. 5. The description promised a pool table. What the resort has is a decrepit, broken pool table under a tarp. Good service, bathroom with bathtub and clean soft bed. We had a good stay at SKY. Room service every day and clining. Bathroom is big and have a nice spa bathtub. Good service. Overall out stay was great. Breakfast usually consisted of eggs, toast, fruit, coffee and juice. The motorbike rental was great as this hotel is very much so out of the way. If you want to head into the town of Krabi and head to Railay Beach, be prepared for a ride. 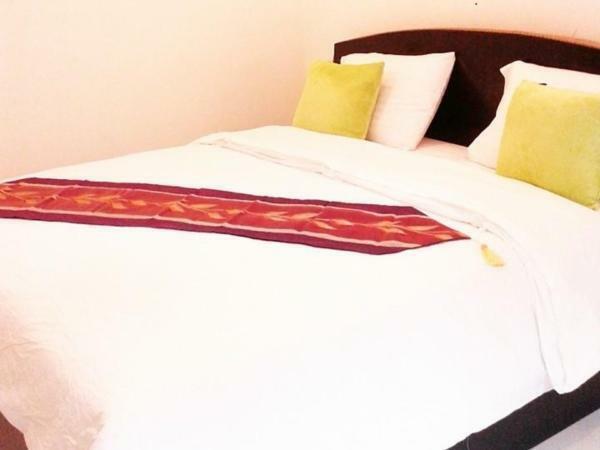 If you are searching for a quiet and relaxing accommodation, this would be a suitable pick. The hosts are very helpful but non intrusive. Arrive prepared at the airport with exact directions to the hotel. As this hotel is off the beaten path, and we were unfamiliar with the area, it took our cab driver over an hour to find the hotel and ended up costing us hundreds of dollars in roaming charges since we needed to use data to find our location with Thai directions. The hotel itself was good! Just more out of the way than we expected. das Konzept was sie sich gedacht haben. Der Fahrer der uns gleich am nächsten Tag gleich in ein anderes Ressort gebracht hat. Die Ruhe. Katastrophal. Dreckige noch mal annähernd der Beschreibung. Wir waren danach in günstigeren Resorts, die weit besser waren. Die Leute waren zwar bemüht, aber es war einfach nicht erträglich. Werde auch mein Geld zurückfordern. Es ist einfach nichts in der Nähe!